Faraday undertook his work throughout a period when the sciences were changing rapidly, as they were yoked into distinct specialties, and as his own area, the experimental physical sciences, became dramatically more sophisticated. Under Davy’s and other Royal Institution figures’ supervision, he learned the techniques of chemistry, and undertook all his early work in that field (and is credited with the discovery of benzene). When Faraday initiated his interest in electricity and magnetism early in the 19th century, the harnessing of galvanic currents by means of voltaic piles was a recent innovation that had sparked extensive investigation into electrochemical effects (an alternative explanation is here). Davy was a leader in this new field of study, and Faraday would likewise become an expert. Faraday would eventually fall out with Davy—who would oppose his election to the Royal Society—and he came into his own at the Royal Institution only after Davy’s death in 1829. Before that happened, in 1820 the Danish chemist Hans Ørsted demonstrated a relationship between galvanic currents and magnetism, prompting a number of researchers, including Davy and Faraday, to develop an interest in these phenomena. Faraday, though, was one of a smaller number to pursue this line extensively over many years. In the early 1830s, he undertook the experiments leading to his most famous discovery: electromagnetic induction (cute demo here). He would continue on the subject through that and subsequent decades, and this work would provide the content for his key publication, the multi-volume Experimental Researches in Electricity, which began appearing in 1839. Through creative experimentation and intensive philosophical reflection, Faraday would establish many of the basic concepts and principles upon which the dramatic advances in electromagnetic theory of the second half of the century would be built. Aside from his foundational discoveries, he also pioneered the use of ideas such as “lines of force” and the “field”. Though a more disciplinary “physics” founded in mathematical argumentation would rise to prominence during Faraday’s lifetime, he himself was not trained in mathematics and would not participate in that development. Faraday did participate in the turn toward methodological rigor. For example, he neither understood nor approved of Ørsted’s discussion of physical problems in terms of the quasi-mystical Naturphilosophie then in vogue among many scholars in Germany, and he held no real interest in cosmological problems as did his natural philosophical forebears of the previous century. He felt systematic speculation was intellectually and religiously presumptuous. But he was interested in developing physical theories concerning the phenomena with which he worked, and took problems such as the nature of matter seriously—notably, he rejected the possibility of atoms. He debated the meaning of experimental results with James Prescott Joule (1818-1889), and consulted with the methodologically-minded polymath William Whewell (1794-1866) to develop appropriate terminology for the apparatus and phenomena involved in his work, much of which remains with us (such as “cathode” and “anode”). The literature on Faraday has observed the centrality of his Sandemanian faith to his life and science. The Sandemanian sect was exclusive and unobtrusive, demanding moral stringency from its members, while maintaining a distance from political and social affairs. Faraday adhered to its requirements closely, believed in a literal interpretation of the Bible, and was active in Sandemanian church affairs. Faraday’s faith contributed to his idealization of the pursuit of science, which he maintained should be a disinterested and collaborative pursuit of transcendental knowledge. Like religion, it was to be contrasted with the selfish ends of the trades and business, which he had experienced first-hand in his apprenticeship. While in many ways these qualities made him a consummate man of science, his zeal for them frequently made him seem aloof. Though warned early by Davy that such ideals could not stand muster to the reality of science, and seeing the same for himself throughout his life, he continually strove to maintain a personal remove from business, national politics, and the politics of the scientific community. He only seldom participated in the governing affairs of scientific institutions, but he was civic-minded, frequently committing himself to consulting for various government and military departments in an ad hoc capacity. 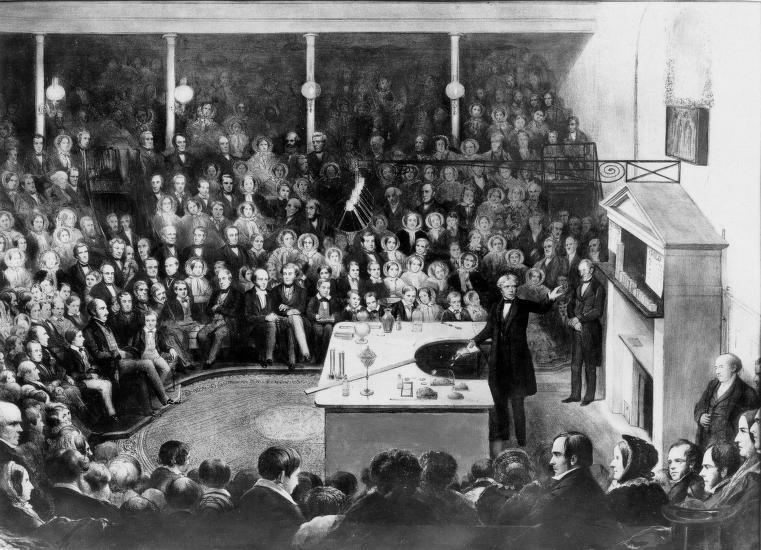 While chemistry was frequently associated with practical development, Faraday always felt most at home in the basement laboratory at the Royal Institution pursuing general truths. Still, he was firmly dedicated to spreading scientific knowledge. He decried the state of public understanding of science, pushed for widespread scientific education, and paid careful attention to the technique of delivering a compelling and understandable lecture. By the middle of the nineteenth century, in addition to being among the most respected scientific minds in Britain, he was also a top draw for the educated classes of London. The literature on Faraday is predictably vast, and serves a diverse array of functions and audiences, beginning with a biography written by Faraday’s friend John Tyndall. The latest biographies are James Hamilton’s Faraday, The Life (2002) and Alan Hirshfeld’s The Electric Life of Michael Faraday (2006), which are straight pop accounts. Professional readers should be prepared to turn a blind eye to brow-furrowing sentences like, “It was a definitive instance of the star scientist creating spectacular effects to pluck one more certain fact from the bosom of nature” (Hamilton). Geoffrey Cantor’s Michael Faraday: Sandemanian and Scientist (1991) is a good (if maybe a bit overthought) thematic analysis of Faraday’s religious and methodological outlook. Cantor details some of the key science, but those looking for a science-intensive and chronological account might go back to L. Pearce Williams’ Michael Faraday (1965), which is very thorough but can show its age. It ought to be supplemented by the various methodological analyses of David Gooding. (also see Gooding’s Faraday primer) Sadly, David Gooding passed away in December 2009, and so this resource, which was part of his faculty web page at Bath, is no longer available.